Commercial property owners along Baltimore’s York Road corridor face paying a surtax to fund a proposed business improvement district. Councilman Bill Henry introduced legislation on Monday in the city council to allow the creation of a York Road Business Improvement District. If approved, the a surtax would be charged to market the corridor, provide amenities in public areas and pay for supplemental maintenance and security services. “The fact of the matter is, York Road is a mile-and-a-half long commercial strip. It’s a much longer stretch of commercial (district) than most the Main Streets the city has worked on in the past, and it creates additional challenges in being that long,” Henry, who represents the corridor, said. If the council passes the legislation, the city will send a mailer asking commercial property owners if they support creating the district. The district will only be created if 58 percent of respondents back its formation. The district would be governed by a board of directors including community, business and nonprofit representatives. Henry’s legislation stipulates the majority of the board must consist of property owners subject to the surtax. 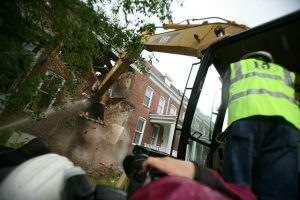 A work crew demolishes vacant homes in the 700 block of McCabe Avenue in 2011. The properties on the east side of York Road were considered a major public nuisance by neighbors. York Road serves as one of the starkest divides in the city in terms of wealth and race. The west side of the street is home to some of Baltimore’s most affluent neighborhoods. While the east side has faced greater struggles with poverty and disinvestment. At the intersection of the communities is a business district that struggles with a variety of issues ranging from cleanliness to crime. The legislation is the culmination of more than six years of work, Henry said, to address issues in the commercial district. “The fact that the communities on one side of the street have a very different level of disposable income than those on the other side of the street presents a significant marketing challenge for commercial properties on the corridor,” Henry said. 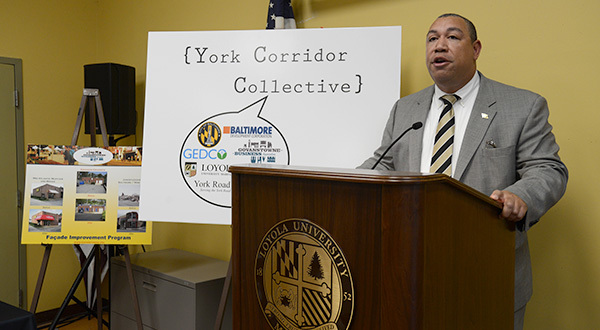 A workgroup consisting of the local business association, individual enterprises, community umbrella organization York Road Partnership, Loyola University Maryland, and city agencies recommended creating the district. Urban Land Institute Baltimore released a report in April 2014 outlining needed steps to improve the corridor between 39th Street to the city line. 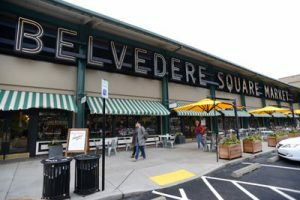 Belvedere Square remains one of the development success stories on the York Road corridor. That report provided a host of recommendations including implementing design standards to fashion a “Main Street environment” that improves and attracts commercial uses. It also suggested pursuing more mixed-use development along the corridor. The York Road Corridor has a number of successful developments on its north end, such as the Senator Theatre and Belvedere Square. But businesses on the lower half of the district have not been as successful. Community groups, such as the York Road Partnership, have long fought poorly operated bars, littering from businesses, and vacant properties primarily on the east side of the road. Look forward to seeing what happens with this!